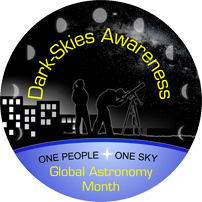 We are currently in International Dark Sky Week that forms a part of Global Astronomy Month. Running between 20th and 26th April, International Dark Sky Week has the goals of inspiring people to celebrate the beauty of the night sky, raising awareness of light pollution and encourage people to take action. Over the week, the International Dark Sky Association website includes information and resources to help with these goals. Whilst promoting dark skies, remember our observatories are located under one of the darkest skies in the country at the Dark Sky Discovery site of Dalby Forest. Our public stargazing events have now finished for the season but will start again in October. Before then though we have our annual Starfest star camp that this year takes place over the August Bank Holiday weekend. If you are thinking of attending the camp then we advise you book soon as over half of the pitches have already been sold. This entry was posted in News and tagged Dalby Forest, Dark Sky Discovery, Global Astronomy Month, International Dark Sky Association, International Dark Sky Week, Starfest. Bookmark the permalink.